I can't believe he's actually doing it. Vijay is turning into a Farmer. Experimenting on Rented Land. Vijay had been reading the property supplement of the paper while I applied my mind to the cryptic crossword. He folded up his paper with a businesslike rustle and waited for my reaction. As I had already learnt, nothing made Vijay happier than finding out about the options. This obsessive behaviour applied not just to new purchases or investment decisions – even when he had to choose which socks to wear, he would first check out the options. Basically, he liked having a choice in every matter. Perhaps it made him feel in control. Privately, I put the matter of land completely out of my mind. After all, I reasoned, it had taken us four weeks to buy a sofa. Land would probably take four years. Vijay was happy again and I thought maybe it actually wouldn’t be such a bad idea to own some land near Bangalore. The busy corporate couple that we were, it could be our weekend sanctuary. A place where we could perhaps even entertain good friends. Get away from the madness of the city for a couple of days of rustic rest and relaxation. Saturday rolled around and the two of us got ready bright and early. We were meeting the broker Dilip in the city and then driving together to the land. It was a beautiful morning. The weather was pleasant and mild and there was a cool breeze. We drove with the windows down, enjoying the fact that we were putting some distance between us and the pollution and chaos of the city. The drive was long but the view was scenic and Dilip was a quiet, honest-looking sort of chap who struck me as the antithesis of the loud, obnoxious type that I had thought a broker should ideally be. He spoke only a little, to tell us a bit more about the land. 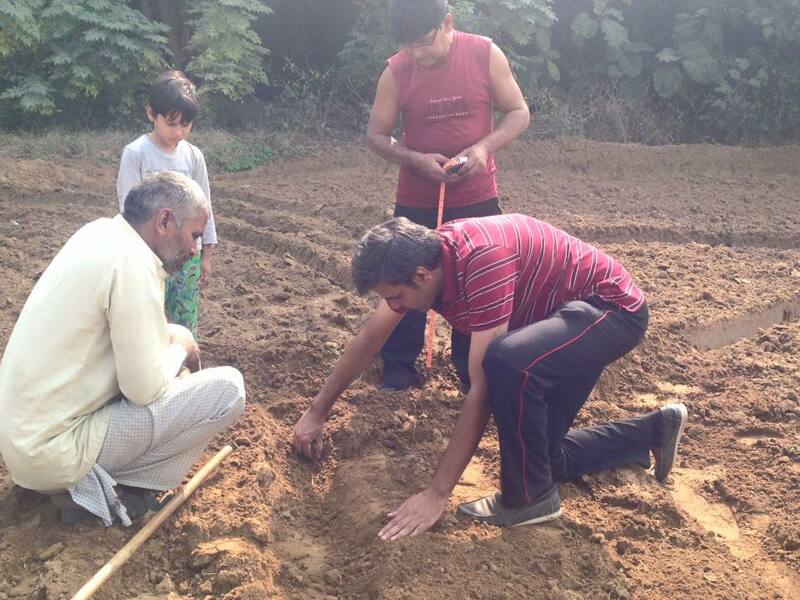 It seemed that it was owned by a family in Bangalore, who had been unable to spend time and money in cultivating it and now wanted to buy some land closer to the city. According to Dilip, they wanted to get rid of it at a throwaway price of five and a half lakh rupees. This still sounded like quite a bit of money to me so I firmly resolved that there would be negotiations – if we liked the land at all, of course. With Dilip’s directions, we finally got to the land. It was quite far from the main road and we had to travel on a dirt track for about a kilometre, which Vijay noted with a muttered ‘Bad approach road’ as he struggled with the wheel to stay on the track. Finally, in a cloud of dust, we pulled up in front of the gate of the plot. We got out, stretched and looked around appraisingly. The plot was fenced off, in the middle of a fairly barren stretch of land. As we walked through the gate, we were greeted by an old Kannadiga couple who served as the caretakers. The place itself was beautiful. It was running a bit wild here and there but it seemed to be teeming with all sorts of vegetation. It was segregated into different parts and to my delight, one portion had mango trees. Vijay walked around with Dilip and the caretaker and carefully checked the various crops. There was a vegetable patch with potatoes, cauliflower, tomatoes and so on. I had a feeling Vijay was already imagining the taste of his all-time favourite dish – alu gobi – cultivated from scratch. The land was also much larger than I had imagined. I asked Dilip about the size and he said it was ten acres. It was so large that I stopped following Vijay around after a while and just sat down on a tree stump. It was quiet and peaceful. The cool breeze brought with it scents of the different plants and trees. The only constant sound was the buzzing of insects. There were also a cow and a few goats owned by the caretakers which, I thought approvingly, gave the place just the right sort of rustic touch. It was intoxicating. I observed him as he sat crosslegged next to the borewell. The white kurta that he had donned for the visit made him look like some sort of benign, mild-mannered young thakur. He asked the caretaker all sorts of questions about the different types of soils on the land, discussed with him and Dilip the merits and demerits of the various crops, which had thrived and which had not, and even held forth on what, in his opinion, the owners could have done differently. They had an extended conversation and the caretaker’s wife then served us steaming tea in steel glasses that were so hot that they were a challenge to hold. ‘Made with goat’s milk,’ she said in Kannada and Dilip translated for us. We were a bit sceptical about how it would taste, but after a sip or two, we were pleasantly surprised. Vijay nodded and we went back to Dilip. Vijay said that we were prepared to look at the land, but only for five lakh rupees. Dilip said that five and a half lakh was already a very low price and that we could ask anyone about it. But he would try and convince the landowners to consider this price for us because he thought we were a very nice couple and he hadn’t seen any of the other prospective buyers take such an interest in the different aspects of the land as Vijay had. We also seemed to have the blessings of the caretaker and his wife, as they stood around eavesdropping blatantly, with ingratiating toothless grins. We shook hands with Dilip solemnly and left, thanking the caretakers for their hospitality. We were now very excited about the prospect of owning the land. It was a fair amount of money for us, because I had just started work and Vijay had not felt the need to save a single paisa of his earnings till now. But we were certain we would be able to arrange it through some means – maybe a loan. 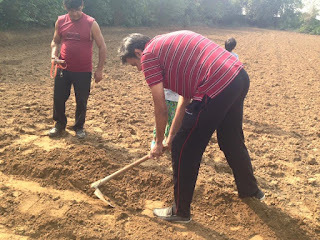 When we got home that evening, we talked about the various things that we would do with the land, maybe construct a little farmhouse on it over time or even a small guest house, eventually developing it into a resort. Vijay started off on his agricultural plan, but I tuned out again somewhere around jatropha and instead closed my eyes and imagined indulging myself in the jacuzzi of my very own spa-resort, while he rambled on happily about the various crop options. By the time Monday rolled around, we were convinced that Dilip would have swung the deal for us and that we now fell in the category of landed gentry. In fact, as we discussed it on the way to work, we recklessly said we would be prepared to pay fifty thousand rupees more for the land, if it came to that. 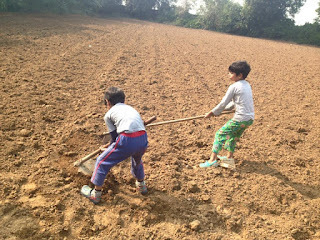 In the office, we talked about it with a few people and they seemed quite impressed, saying that five lakh rupees did sound like a throwaway price for ten acres – in fact, they warned us to be very careful because the price appeared to be so low that perhaps there was something wrong with the ownership of the land. We scoffed at them, saying that of course we would ensure we checked everything out carefully with the help of a lawyer. After all, it wasn’t like we were stupid. ‘Great, sir. I will call you back in one hour.’ Dilip hung up. Vijay looked over at me and nodded. He held out his hand and I high-fived it. ‘It’s okay, sir,’ said Dilip modestly. ‘It’s a good deal, sir. His voice was all amplified and tinny and his words seemed to echo in the ensuing silence. ‘Fifty-two lakh rupees?’ Vijay’s expression as he looked at me was a mask of horror. I was sure mine mirrored it. Dilip was taken aback, ‘But sir ... the meeting tomorrow?’ Vijay said, ‘Okay bye’ and hung up. ‘Poor Dilip,’ he said once the laughter had passed. We maintained a respectful silence for him for a minute. Then Vijay asked me, ‘So exactly how do you plan to explain this to him?’ He deftly ducked out of the way to avoid the pillow I threw. Poor Dilip was quite disappointed when Vijay finally called him to explain why we were backing out of the deal. Vijay said that we had consulted with some legal experts and there were apparently quite a few issues with the registration for ownership of agricultural land, especially in Karnataka, and it was not a hassle that we were willing to take on at the moment. He also added that we had decided we needed to be a bit more practical and purchase a flat before thinking about any other large investments. He thanked him for his efforts and apologized for the wasted time. Dilip, who seemed to epitomize the expression Nice Guys Finish Last, said that he understood and respected our decision. He also agreed that the registration issue was a real problem in Karnataka if you didn’t happen to be originally from the state and said it was wise of Vijay to have found out about it. Of course, said Vijay smugly, it was our investment, so we had to look at it from all angles. After all, it wasn’t like we were stupid. And seriously? Like father, like sons. My men all believe in getting their hands dirty. I remember it perfectly! That was one of the many hilarious chapters of the book.